We are your Cincinnati yard drainage specialists. We specialize in removing wet areas from your property. Using comprehensive systems including French drains, surface catch basins, dry creeks, drainage swales and grading to name a few, we can make your property usable again. Is your yard saturated long after the rain has stopped? We can help. Our experienced team will design a comprehensive drainage solution for your property that will capture the water that is causing the problem and discharge it to an appropriate spot. We will schedule an appointment with you, at your convenience, and evaluate you specific issue or set of issues and address each one accordingly. We will answer all of your questions about the right solution for your property and then deliver an easy to understand proposal for your consideration. It's just that easy. Once you have the opportunity to evaluate the proposal, if you have additional questions about the project, we answer all of them as quickly as possible. Once you have taken your time, done all the research to become comfortable with the solution, we will schedule an approximate start date. We will NEVER pressure you into making a decision! We want to earn your business by giving you all the facts necessary to make an informed decision, not with high pressure sales tactics! 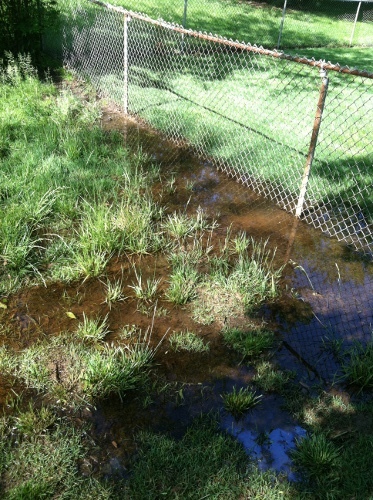 Even if you have this much water in your yard, we can help! Using the combination of a surface catch basin and a French drain system, this yard was dry and growing grass within just a few weeks! If you have a Cincinnati yard drainage issue, give us a call, you'll be happy that you did! We are the preferred Cincinnati yard drainage contractor! We have helped thousands of homeowners and commercial customers alike resolve long term yard drainage issues. Through this experience, we can diagnose and design a system to resolve most all surface water issues. We have state of the art equipment, designed specifically to install drainage solutions and the skilled man-power to get the job done right the first time. Follow-up after the project is complete! Once your project is installed, we automatically send a "touch-up" crew back out to your property between 30 and 60 days after completion. Because of the nature of the drainage system installation process, there will be areas that settle more than expected and areas that don't settle as much as expected. This happens because of the nature of our soil here in the Ohio valley. We have a mixture of clay, topsoil and rock and although, through our years of doing this we have a great understanding of how much the soil will settle after the project is complete, the mix of soil and the amount of rain we receive after the project is complete will have a bearing on what the settling rate will be. We follow up to ensure that the drainage site is a flat as possible and that the grass is growing as it should. This touch-up process is at no charge to you, the customer. We do it to be sure that the system is working properly and that your property is looking good after the project is completed. 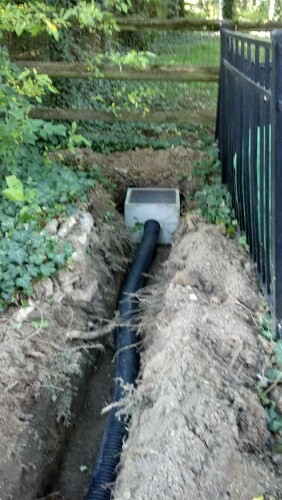 This depicts a small surface catch basin being installed that is taking water that would have created a pond over the driveway and soil, collecting it and discharging it to daylight downhill. Without this small catch basin, there would be a small pond measuring approximately 40' in diameter creating a mess after the rain stopped!